New Ulm was designated a “Preserve America City” by the President’s Advisory Council on Historic Preservation in 2006. Soon after, we received several grants to fund work on our historic downtown, including the creation of our 16 video podcasts, a new Walking Tour guide, new historic markers and a prototype of our first “Eyewitness to History,” Frederick Kiesling. One of the most interesting pieces of our downtown history is the 1862 Dakota War, where two pitched battles ensued between early settlers and the Dakota Indians. Most buildings in the town were destroyed during this time; three original structures remain – the Forster Building, the Erd building (whose basement served as a hiding place for women and children) and the wooden home of Frederick Kiesling. 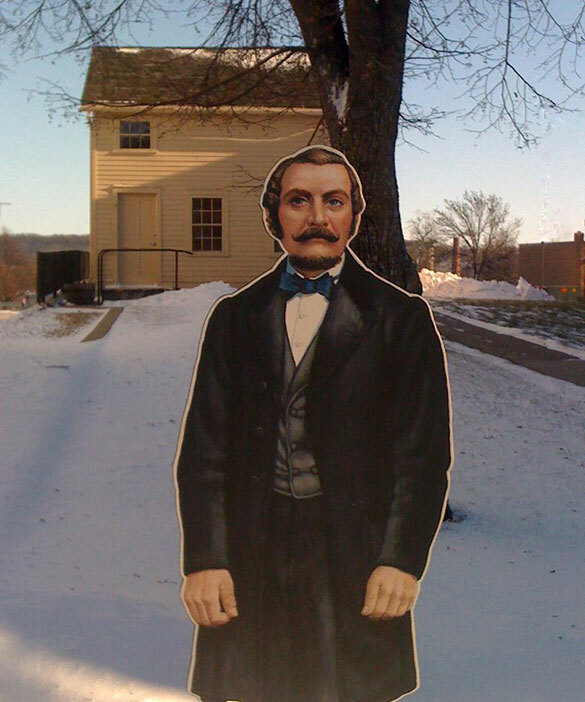 The life-size figure you see in Kiesling Park is of Mr. Kiesling dressed in his Sunday best. Stop at the Visitor Center to get the Walking Tour brochures and more information.